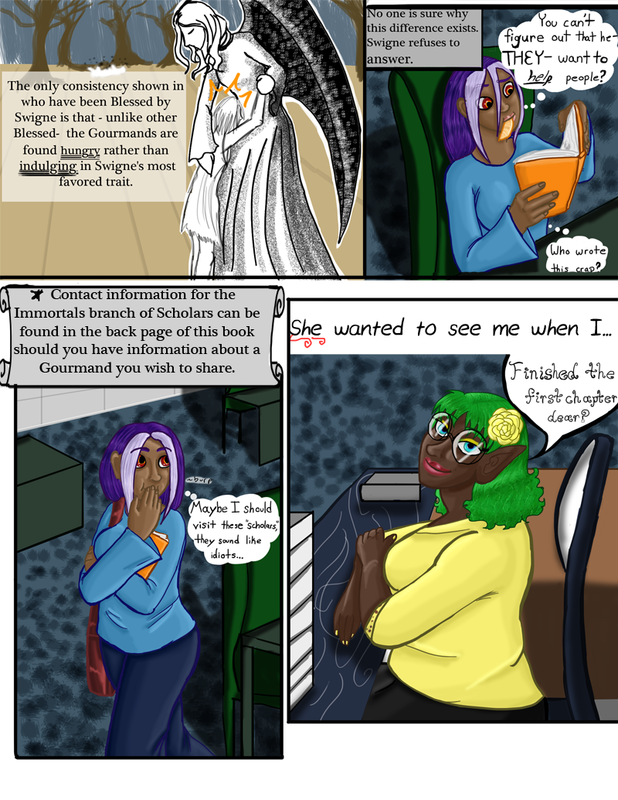 Chapter 01- Blessed - "Chapter 1 Page 12"
Book: The only consistency shown in who have been Blessed by Swigne is that – unlike other Blessed- the Gourmands are found hungry rather than indulging in Swigne’s most favored trait. Book: No one is sure why this difference exists. Swigne refuses to answer. Wynn: You can’t figure out that he- THEY- want to help people? Who wrote this crap? Book: *Contact information for the Immortals branch of Scholars can be found in the back page of this book should you have information about a Gourmand you wish to share. Wynn: She wanted to see me when I.. Librarian: Finished the first chapter dear?